Musicals — particularly the Technicolor extravaganzas created by MGM’s “Dream Factory” — are among the most universally and enduringly popular films of Hollywood’s Golden Age. They are not, in other words, obscure. The mechanics behind them, however, often were obscured from the public, as the rise and fall of this once-dominant genre was not — as if often believed — simply caused by shifts in public taste, but by behind-the-scenes business practices within the film (and, eventually, record) industry and savvy use of emerging technologies that shaped those shifts in public taste. The development of talkie films in 1927 revolutionized the film industry, but major Hollywood studios only committed to musical numbers after codifying their relationships with the music world: In 1929, MGM spent $10 million to purchase a single music publishing company, just one of numerous similar acquisitions; other studios soon followed, each therefore securing large pools of available music for use in its films. The practice allowed studios to work with songs they already owned, and to recycle them, most notably in the early Fifties, when MGM built two of its biggest successes, An American in Paris and Singin’ in the Rain, around previously used music — in the former, the work of Ira and George Gershwin; in the latter, a clutch of songs from late Twenties and Thirties musicals. This cost-cutting measure ensured Hollywood’s penchant for musicals (as well as the use of show tunes and set pieces in everything from film noir to cartoons) and helped Hollywood become a force in the sale and promotion of songs and sheet music. It did little, however, to push the pop music landscape in new directions, as throughout the Thirties musicals primarily featured adaptations of already popular music styles and sources — Tin Pan Alley, British music hall, the dramatic musical (first typified in 1927 by Show Boat) — in rigid, set piece-driven narratives such as operettas, musical comedies, Broadway adaptations, backstage melodramas, and biopics about song-and-dance men. This Broadway technique not only echoed the participatory nature of the parlor but also carried remnants of British music halls and American vaudevillian acts. 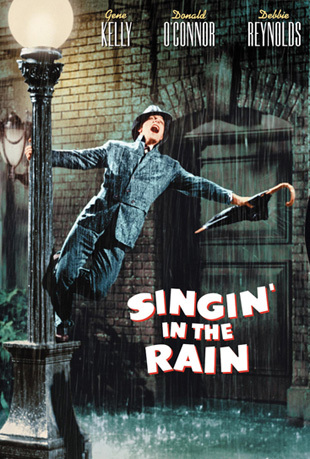 It helped producers realize that films punctuated by spots for an audience sing-along were going to be hits with a crowd. It also introduced on-screen song-and-dance performances built around social activities or rustic locales familiar to audiences (an Iowa state fair, a Kansas farm, a Missouri trolley car) rather than in exotic urban locales such as nightclubs or Broadway stages. Even as the film musicals became dominant and central to the music industry, the seeds of their demise — and, by extension, the rise of the rock era — were being sown. In 1941, the era’s primary publishing company, ASCAP, which dominated the music industry at the time, went on strike to demand a larger cut of radio royalties. For roughly the first 10 months of that year, songs owned by ASCAP — which two decades earlier had tried to sue to prevent their songs from being on radio at all — were off the air. The arrogance and greed of the large company gave its upstart competitor BMI — a smaller, more artist-friendly corporation — a way in at radio stations that rarely aired their material. Most importantly, many of BMI’s works were radically different than the typical musical film soundtrack. Instead, they owned a significant amount of regional or black music — bluegrass, rhythm & blues, country, folk — that was not prized by the New York-based ASCAP or Hollywood. The ASCAP strike, much like SoundScan would decades later, forced the music industry to pay an increased measure of respect to music it often sneered at. Broadway and musical film had borrowed motifs and looks from rural America — think Show Boat, State Fair or Oklahoma! — but the music was still primarily Tin Pan Alley. The increased airing of local or race- and class-based music, however, sped a splintering of tastes and subcultures, loosening Hollywood’s grip on the music industry. Radio itself was, by the Forties, in the hands of DJs and local advertisers, further accelerating this process and dividing audiences into smaller groups, acknowledging different backgrounds, local tastes and, eventually, age groups. Once the rock era began in earnest, rock and R&B dominated the 45 single format, but they were still largely teenage obsessions — and they were aided in great part by Hollywood. Rock itself arguably became a sensation when the whip-crack opening of Bill Haley & the Comets’ “Rock Around the Clock” played over the opening of Blackboard Jungle, which famously caused riots in some London theaters. The two totems of the rock era, Elvis Presley and the Beatles, each enjoyed breakthroughs thanks to appearances on The Ed Sullivan Show, a vaudeville-like variety show, and forays into Hollywood. Presley, in particular, geared much of the first decade of his career around film musicals. In its infancy, however, rock music was ill-suited for the 33 LP record and, despite popular belief that it immediately vanquished show tunes and crooners, in nine of the first 10 years of the Billboard album charts (1956-’65), the year’s best-selling record was a cast recording or film soundtrack. Even at the height of Beatlemania, when the group dominated the singles market, the best-selling albums were the cast recording of Hello, Dolly! and the soundtrack to Mary Poppins. In the late Sixties the music industry finally focused rock into the album format, and a new generation of film musicals — Grease, Saturday Night Fever, Nashville — were derived from the ancestors of the roots and race music BMI helped popularize back in 1941. If some of the mechanisms that fueled these shifts seem familiar — particularly, protracted battles involving music publishers and hand-wringing over emerging technology — they should. In this century, the record industry has seen exponential losses, thanks in part to the demise of radio and an unwillingness to adapt to and absorb digital music. Increasingly, artists are again marrying the commercial health of their music to other industries. Licensing to films, TV, and advertising has become a profitable outlet. Newish bands such as Snow Patrol, Peter Bjorn & John and Death Cab for Cutie have generated buzz by soundtracking key scenes in prime-time TV dramas. OK Go became an overnight sensation thanks to YouTube. Even established artists are using their clout to tie marketing campaigns with corporations outside of the recording industry: Wilco teamed with Volkswagen to produce a series of spots coinciding with their Sky Blue Sky LP, and even Paul McCartney recently saw record sales rise by having his newest record sold by coffee giant Starbucks rather than the seasoned pros at Capitol Records. Indeed, record shops themselves are becoming extinct, replaced by big-box general stores and online outlets. The notion that the record industry is the driving force within the music world is quickly becoming antiquated. It can already be argued that the musical was resurrected as a primary force within the music industry two decades ago when the impact of MTV became clear. Now it’s not difficult to envision an uptick in the return of Thirties- and Forties-style musicals if savvy artists continue to place their commercial health in the hands of film, TV, ad men and YouTube. In a sense, the shift has slowly begun. The best-selling album of 2006? Disney’s High School Musical.